Hi everyone and welcome to this months creative challenge! This month, is all about the beautifully bold and vibrant hibiscus flower. Here on the Costa del Sol, we have these gorgeous flowers in abundance in reds, peaches, yellows, pinks and beautiful combination. Our Creative Costa images above were taken around the gardens and areas where I live. There is a beautiful large hibiscus bush on the way to the beach which I love to walk past and gather up the buds that fall. I often make nature mandalas from hibiscus buds also! JOURNAL PROMPTS: Before you start creating, take some time to connect to these flowers, the shapes, the colours, what they might smell like, rain on the petals, buds, seeds, leaves of the plant. What are the initial thoughts that come to mind when you think of this flower? 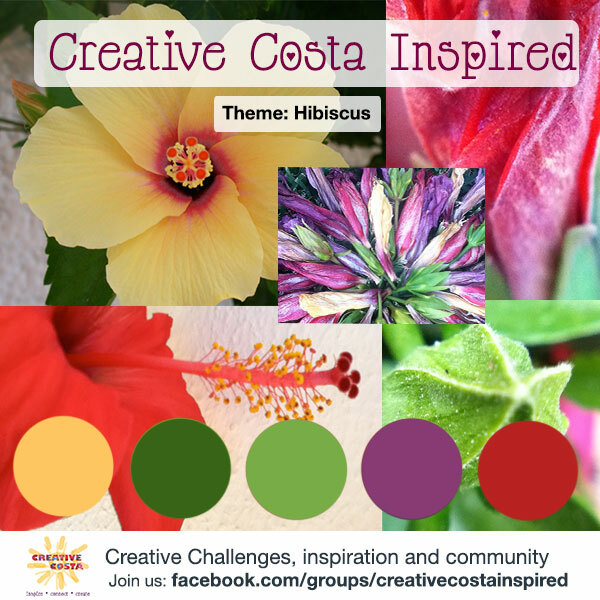 This challenge is to create something with the theme of the hibiscus flower or a combo of the colours shown in the palette above. Let’s play with the shapes, colours and patterns we see. I believe that when we create in the form of play, beautiful things will happen. We let go of the expectations of what the final result will look like and loose ourselves in a blissful creative zone. This is my wish for us this month. To lose ourselves in the joy of creating, just because it is fun! Because we are ‘just playing’ anything goes! 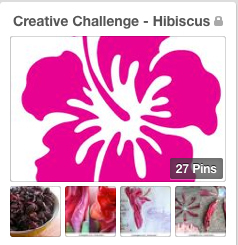 THE CHALLENGE: Create your own Hibiscus flower inspired piece. • Gather photos of hibiscus flowers and share with the group. If you have any where you live, try photographing the different stages of growth, so a bud, blooming bud and fully blossoming flower. OR pick out the shapes and patterns with your macro lens. • When you think of this flower, what are the words, feelings and colours that speak to you? Cut these out of magazines or write them out and glue onto your image or just collage them onto a blank piece of paper. • You can also use the colours or theme to add to an existing project if you would prefer to stick with your current medium. I am excited to see your creations! I Also set up a Pinterest board with a collection of hibiscus inspired creations, so if you are craving more image inspiration, here is a lovely eye candy start!